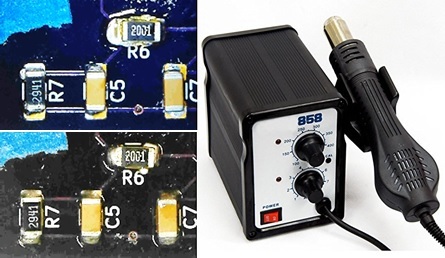 If you want to learn hot air soldering, you need to practice first. I didn’t and that was a mistake. What looks easy on You Tube videos takes some effort to learn in real life! If you have been following my activities, you know that last fall I decided to try working with surface mount devices. I bought a moderately priced hot air rework station and some solder paste on Amazon. The paste should last a couple of years if I store it refrigerated. Although a simple design, the heat gun works well but I need to add about 25 degrees to the dial setting to get desired temperature. As part of my wideband magnetic loop project, I designed some amplifier circuits using op amps and SMD components. Also, I had the boards professionally fabricated at OSH Park. So, now it was time to learn hot air soldering and put the circuit boards together. I must have watched a dozen You Tube videos like this one which made hot air soldering with paste look pretty easy. But, it needs to be learned. My mistake was to jump right in to making the final boards without some practicing on scrap circuits. As a result, my first two boards were pretty messy. You can see my first attempt top left above. Did not use enough solder. The second attempt bottom left was better but still messy. I still have not gotten either of these boards to work properly. Good news is that my third attempt (to be shown later) went really well and worked great first time. If you plan to learn hot air soldering, get some learning kits or scrap boards and take your time figuring things out. Three things. Paste, placement and heating. It’s relatively easy to push the solder paste through the syringe, but harder to get the amount right. You need to get a dollop of paste onto each solder pad, almost like a swirl of ice cream on top of a cone. Don’t worry if you have a bit too much solder spreading out of the pad. A bit too much is better than too little. One of the great things about solder paste is that it will hold your component in place. But you need a very steady hand to place the parts. Don’t worry if placement is a bit off. Capillary action as you heat the solder is wonderful. It will pull solder onto the pads and pull small components into proper alignment. Heating is the tricky part. As you warm up the board, the solder paste will soak into a syrup-like mixture, or maybe like melted ice cream. Then, when you apply the higher temperature you get reflow, as the solder turns bright and pulls into the pads and up on the components. I have achieved best results with around one minute of pre-heat/soak, followed by 15-20 seconds of reflow at higher heat. For me, I got the feel of things on the third board, which turned out well.